We are a leading Service Provider of digital vision system from Coimbatore, India. Delta Electronics is proud to announce the DMV Series, our first machine vision system, which excels at inspection applications for industrial automation. 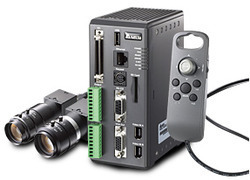 After years of research and development, the Delta DMV Series is the first embedded machine vision system developed and designed by a Taiwanese company. With the rapid changes in technology today, Delta’s DMV Series is designed to fulfill the requirements of industrial users. Today’s global markets demand a professional and easy-to-use digital machine vision system which has a professional technical support team for problem-solving and technical consultation. Besides the excellent features and user-friendly functions of the DMV Series, Delta offers a strong technical support team and a strong R&D team to provide you with the solutions and services you need for all types of industrial automation inspection systems. The DMV series features various inspection functions to assist the automated production line perform tasks such as: quality inspection, dimension measurement, object counting, recognition and verification, auto-positioning and assembly, and many more. It is equipped with an intelligent and easy-to-use interface, with just a few simple steps, the system can simulate the visual quality inspection process on a production line by capturing clear images of moving objects with high precision and high configurability. It offers complete and versatile detection functions such as: edge position, distance, count, angle, flaws and blobs, image compare, character identification, coordination, angle calculation and more for various detection and monitoring controls. All of these excellent features are dedicated to lowering the dependency on operator inspection by human eye and decreasing errors and mistakes. The traditional inspection process requires operators to check items one by one which increases the rate of mistakes due to fatigue or carelessness. In addition, many product defects are difficult to identify by human eye. Delta’s DMV series with its excellent features and user-friendly interface helps you eliminate many product inspection problems and guarantees product quality while lowering both product return rate and labor costs. The DMV Series also provides multiple input/output terminals for external connection with the interface to lower the cost of setting up hardware. Connections of sensors, light sources, cameras and other data to the DMV Series are easily established via the I/O terminal. Commonly used communication protocols and interfaces include RS232, RS485, industrial Ethernet and I/O interfaces which transmit inspection results to the host controller rapidly while creating a stable system. Various optional accessories are available upon selection for flexible applications such as camera, lens and light sources. The Delta DMV Series provides you with a comprehensive and complete solution for your machine vision system.